In a corporate environment, documents are usually created or captured in a decentralized environment with no overall surveillance. Many corporations have no formal process of retaining these documents as records, which can increase storage costs. In addition, when litigation requests occur, companies can spend a huge amount of money and resources to locate records. In the case when a company is not able to locate records or to locate them on a timely manner, the company is subjected to a financial penalty or, more importantly, damage to the company's reputation. IBM Records Manager is an application and an engine that provides records management capabilities to existing business applications. It provides a single and consistent records management platform to help companies meet government and industry requirements for formal records management. 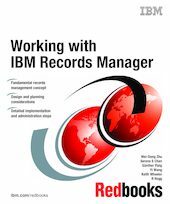 This IBM Redbooks publication provides an introduction to records management and IBM Records Manager. Solution architects, designers, and implementers who plan to implement IBM Records Manager will find this book useful. It also serves as a guide for system administrators or records administrators in performing common records management administration tasks in IBM Records Manager. Lastly, the first part of this book serves as a good starting point for anyone who is interested in exploring the world of records management.